Two by two, former Infinity Ward members are joining Jason West and Vince Zampella at Respawn Entertainment. Unfortunately, there's no way to know for sure if they have hands of blue. The birth of Respawn Entertainment was an interesting - if not entirely unexpected twist on the ongoing Infinity Ward meltdown. It was slightly ironic that West and Zampella had formed a new studio in conjunction with EA, in no small part because that had been one of the things that Activision had originally fired them in suspicion of. Given that Infinity Ward was originally founded by West and Zampella out of former employees of Medal of Honor developer 2015, it's no surprise that ex-IW members have been signing up with Respawn by the droves. According to G4, two more have shacked up with Respawn from Infinity Ward. This latest duo is game designer Mohammad Alavi, now listed on his LinkedIn profile as Respawn's "Senior Map Monkey," and Brad Allen, former senior artist at Infinity Ward, now senior artist at Respawn. 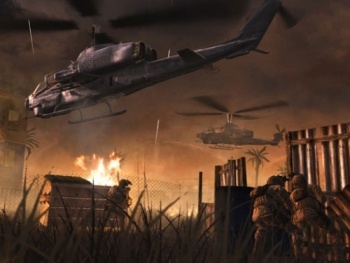 Alavi helped design the infamous "No Russian" sequence as well as the mission "Second Sun" in Modern Warfare 2, and Allen claims he joined Respawn because he was "joining forces with a team of deadly ninjas." And nobody wants to be arguing with deadly ninjas, right? Last week, Activision boss Bobby Kotick said that he regretted the events that had led him to the decision, but that he had had no choice but to fire West and Zampella. He also admitted that more would leave Infinity Ward before all was said and done. Smart money says that most of those people leaving IW will wind up at Respawn under their old bosses.